I’m researching a new book at the moment, and that involves wandering around London with my mouth hanging open, drinking too many cups of coffee and nearly getting run over a lot. Part of the puzzle is reconnecting London’s absurdly dense and convoluted history with its present-day reality, so I’m grateful for days like yesterday, when the river mists rolled in and the present day rolled back. By the time I reached Kentish Town the sky was the colour of greaseproofed paper and the streets looked like wet pebble beaches. It was as if I had stepped into a sepia photograph; greens had become charcoal grey and even bright clothes looked as if they’d been colour-adjusted. The overall effect was like turning down the brightness on your computer screen to almost zero. A great many of the buildings like this, the Southampton Royal Academy, whatever that might be, were now in 1885 instead of the present day. This is the best time to visit small parks, the kind where there are still gravestones stacked around the walls. It’s amazing how many London parks have graves in them – they were once privately licensed for burials – and I’ve always thought it odd how Londoners are comfortable eating their lunchtime sandwiches on tombstones. By the time I reached home the mists were burning away, leaving a fierce milky flare in the skies that lit offices gold and pink. The perfect research day. A very fine piece of descriptive writing, Admin. The “sky the colour of greaseproofed paper…” Read it through several times. I swipped Maggie’s (?) stuffed cat, that beastie with the rolling eye, for a mo’ and aimed it Londonward. This is what it found: Southhampton Royal Academy, part of the Southhamption University, has had a a nice grant from Microsoft, among others, to fund the continued research of still-researching top academics. That sounds valuable and based on the photo above foursquare. Yuck, yuck. (Is that a redhead on mobile there? Based on the tall boots I’d say so.) Just asking. “Swiped” is a past participle and while the word “participle” has two p’s in it, the word “swipped” in line two above does not and should not. I’m glad you can focus, Dan, even if it is after the fact. I believe it to be contagious as I have found posts of my own lacking the second of a parenthetical pair and mis-spellings of a most unfortunate sort. My question is with regard to the sign on the premises to the right: “ale, cider, meat”. That is peculiar but at least the last item is not overly detailed in that it does not specify what type of meat, what specie or species is/are represented. Do you suppose the researchers go there for a pint and a pie after considering the appropriate resting place for Richard III or how many meteors are likely to hit inhabited parts of the earth? 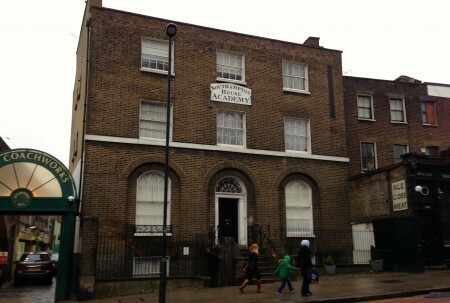 I just enlarged the image, read Southampton House Academy, googled same and found a Grade II listed Heritage building at 141 Highgate Road, Camden Town. It is an early 19th cent. building, now divided into flats, but originally it was the Southampton Academy run by Sir John Bickerstaffe. You can’t make these things up. It originally had a wing attached. I wonder if the wing was where the — Coachworks est. 1974 is now located.